Owner Joe DeShayes started mowing lawns for neighbors to make extra cash when he was just 10 years old. Joe noticed that certain properties stood out from others. The feel, the aesthetic, the beauty; these elements made him feel comfortable, relaxed, and at ease. Curious about how to achieve this feeling, Joe asked his clients who did their landscaping and they all said Art Tucker, a landscape architect from Collingswood, NJ. Soon after, 12-year-old Joe rode his bike from his hometown in Haddonfield, NJ, to Art Tucker’s office, asked about his profession, and how he could become a Landscape Architect like him. After speaking with Art, Joe knew that he wanted to create that comfortable, relaxed, at ease feeling and he knew he wanted to learn as much as he could about designing & building to create that feeling for others. At the time, there were only 22 universities in the county accredited to teach Landscape Architecture, and Rutgers was one. Joe would soon learn that design and environmental psychology principles were responsible for those special properties that stood out to him many years ago and that mastering those principles would be how he would achieve creating that feeling for his clients. Upon graduating from college with a background in Landscape Architecture, Joe put the lawn cutting aside and concentrated on Landscape Design and Construction, including master plans for developing private residences. As part of the master plans, recreation was usually a top priority for most clients with children. Court sports (basketball, volleyball, pickleball, tennis) and golf, topped the list. 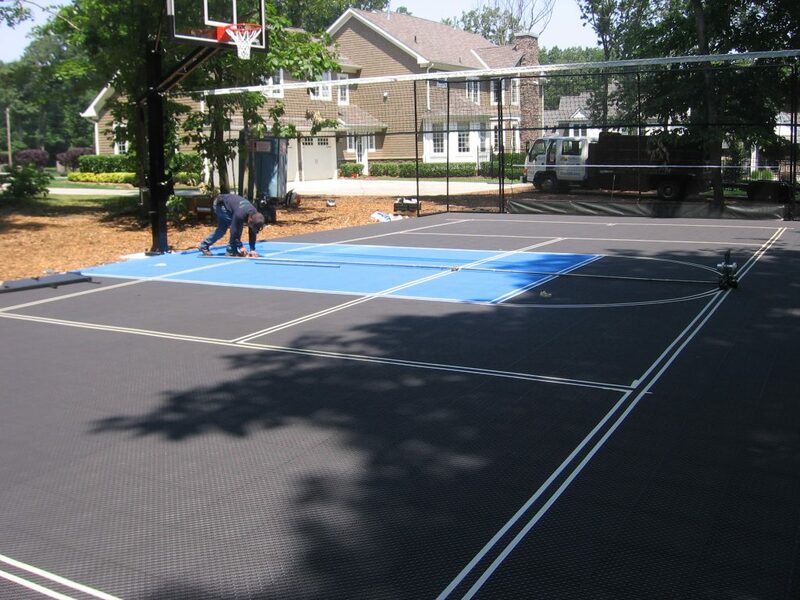 Thus, in addition to DeShayes Residential Resort Design, Joe created DeShayes Dream Greens and DeShayes Dream Courts. About the image [top left] : Young Joe DeShayes drawn by one of his little sisters when she was 10. The drawing featured Joe and his 9 other siblings doing their daily activities. Joe, of course, was drawn mowing lawns during the early years of his business. Adding more work to his repertoire came with its own set of challenges, but the most difficult was finding contractors that were competent and knowledgeable in the field. This led Joe to realize the importance of staying up to date with the evolving industry standards and materials. For the next 2 years, and continuing to this day, Joe reads all he can find on designing and building courts and golf greens, including subscribing to the most relevant Academic Journals in the sports facilities industry, along with visiting the manufacturing plants for the components required. Joe found out that most contractors in these fields were using the same methods and materials that they had been for the past 25 years and they were comfortable doing so. That didn’t sit right with Joe, so he made it a goal to always embrace change and continually adapt to have the ability to create the best possible solution for all his clients’ outdoor recreation desires. Team Member, Max, taping out lines to be painted on a multi-sport court [ basketball, short court tennis, and volleyball ]. Staying up to date with the latest and greatest materials and installation methods led Joe to create many beneficial relationships with manufacturers and contractors. Creating these relationships reminded Joe of the simple family values he had instilled in him as a child, and how he always tells his employees family comes first. Being one of ten children, learning the importance of family values comes naturally. Loyalty, honesty, and collaboration are great values to bring into the workplace. They guarantee that clients will be easily guided through the design and construction process to give them the outcome that they deserve, which is why family values are so important at DeShayes, and they are integrated in everything that they do. Another quality Joe exudes that separates him from the rest is his immense passion for his work. Since he was just a boy he has had the desire to give people that special feeling of relaxation and ease, so he has used that passion as a force to help him continue learning so he can provide his clients with the best possible outcome for whatever they desire. Joe has the tools to have sports facilities fit seamlessly into clients’ properties because of his proficiency in the use of design principles and environmental psychology obtained through his training as a Landscape Architect. Joe works closely with each and every one of his clients and is always available for questions and discussions about potential projects because this is his passion. When choosing employees, Joe looks for that same desire to make others happy. All of the employees at DeShayes are reliable, hardworking, pay close attention to detail, and have a passion for outdoor living. To make things simple, Joe tells them to always think of two things: “What’s best for the client and what’s best for the company. As an employee, you are part of the company, so what is best for you?” This attitude ties seamlessly into DeShayes family values and is what makes us stand apart from the rest. 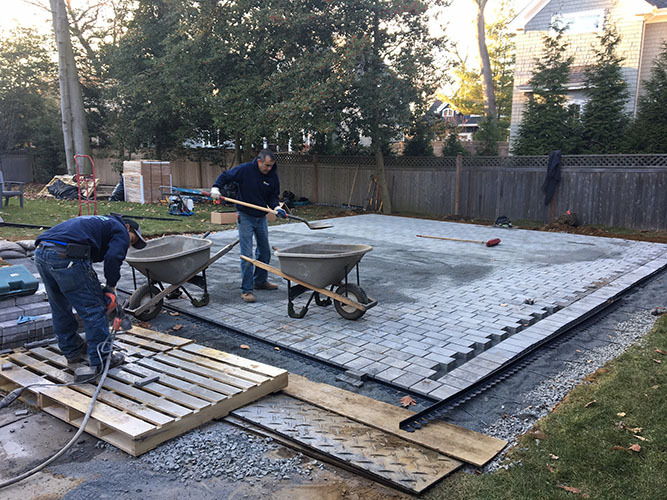 Team Members installing permeable pavers to be the base of a court with a tile overlay. This base allows water to drain through the court and may be best for those with lot coverage issues. Joe DeShayes business owner (right) works closely with all of his clients. 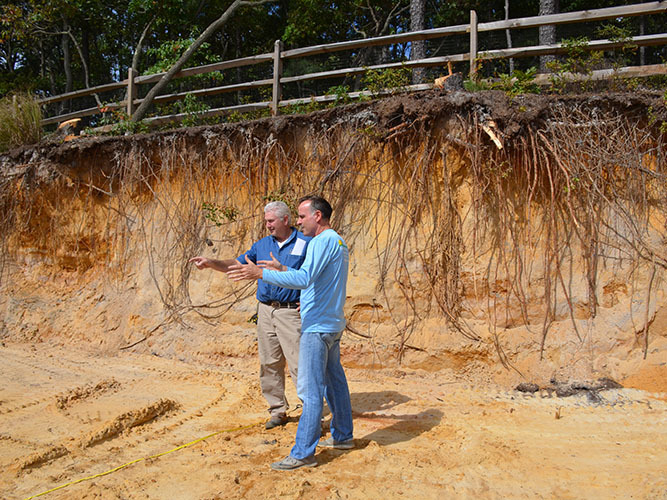 Here he is on site consulting with a customer. 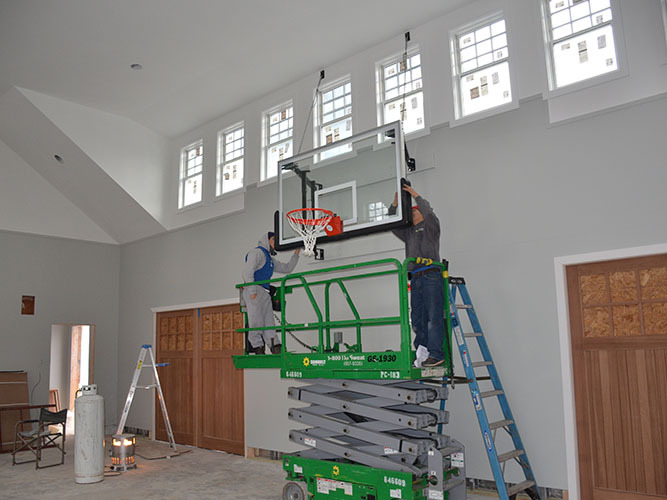 Team Members installing a wall mounted basketball unit in a home garage in Bryn Mawr, PA. They designed a tennis court that won the Residential Tennis Court Complex of the Year from the National Sports Builder’s Association. Joe has been selected to be a judge for an Annual state-wide landscape design competition. He taught an accredited course to the American Society of Landscape Architects on the proper design and construction of basketball, tennis, volleyball & multi-purpose courts and artificial putting greens & golf green complexes. He also went back to his Alma Mater, Rutgers University, and taught a similar accredited course. DeShayes Dream Courts are recognized industry experts, educators of landscape architects, and designers of award-winning projects. Much of this success comes from owner Joe DeShayes, who works directly with each and every one of his clients, treats them like family, shares his expertise, and uses his passion to design and build to exceed their expectations. “For me, the greatest feeling in the world and what I love the most is being able to provide people with an environment that makes them feel comfortable and at ease making their house the home they’ve always dreamed of.” he said.